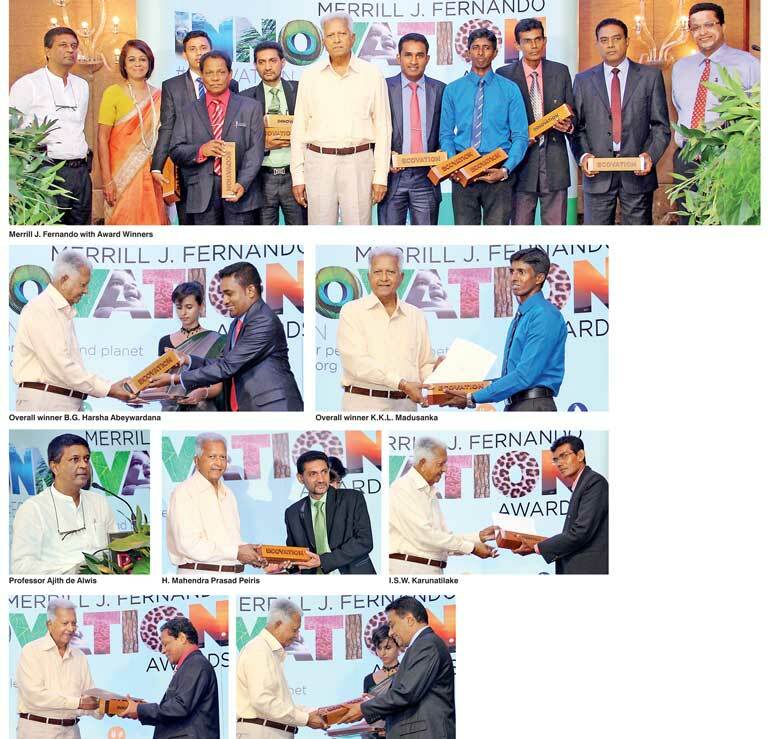 The maiden Merrill J. Fernando Eco-Innovation Awards were held last week recognising and rewarding top creative innovators. The Merrill J. Fernando Innovation Awards calls for breakthrough, purposeful proposals of well-developed concepts and working prototypes that seek to solve current national and global environmental issues in the areas of Waste, Water, Energy, Blue Economy and Biodiversity. The MJF Award aims to benefit both the innovator and the country by not just appreciating a concept or prototype but facilitating its incorporation into society or bringing the ‘Concept to Market’. With this award scheme, Dilmah Conservation hopes to showcase Sri Lanka in a different light and inspire its people to create unique solutions that will carry the country toward a prosperous future. The overall objectives of the MJF Award are to support, strengthen and promote eco-innovation in Sri Lanka, specifically, to facilitate eco-innovations in the market and to unleash the creative mind to address national and emerging environmental problems through innovation and enterprise. Its specific objectives are to highlight and position environmental innovation in the mindset of the Sri Lankan public and the corporate sector through a countrywide awards program, to encourage individuals to explore new ideas and develop novel business pathways, to provide support and an opportunity for all eco-innovators to compete on a level playing field, to ensure the ‘Concept to Market’ by enabling formal linkages between eco-innovators and the business community and to provide Sri Lankan eco-innovators with a platform for international markets. Each innovation will only win one prize. Dilmah Conservation will provide the nine winners with legal support in protecting their Intellectual Property where needed as well as guidance in commercialising their innovations. In addition, the winners will be given the opportunity through Biodiversity Sri Lanka (BSL) to introduce their innovations to the Patron and General Members of BSL, which are blue-chip companies in Sri Lanka, for possible commercialisation. This opportunity allows winners to find potential investors for their ideas and inventions. B.G. Harsha Abeywadena - Merrill J. Fernando Eco-Innovation Award 2016 Prototype Winner. The 37-year-old won the award for a viable approach to value addition to refuse tea by producing bricks, papers, cardboards and orchid pots. The 27-year-old K.K.L. Madusanka - Merrill J. Fernando Eco-Innovation Award 2016 Concept Winner for his concept on an innovative Tank Purifier. T. Sunil Somasiri Gomes - Merrill J. Fernando Eco-Innovation Award 2016 Waste Prototype Sector Winner. Invention of Technology of Spherical Container to World Centrifuge Latex Industry. H. Mahendra Prasad Peiris - Merrill J. Fernando Eco-Innovation Award 2016 Blue Economy Prototype Sector Winner. Herbicide Free Integrated Weed Management. W.M. Jeremy Fernando - Merrill J. Fernando Eco-Innovation Award 2016 Energy Prototype Sector Winner. Power Line Communication Based Energy Saving and Management System. I.S.W. Karunatilake - Merrill J. Fernando Eco-Innovation Award 2016 Water Prototype Sector Winner. Wave-Less Eco Friendly Boat. Raveen Perera - Merrill J. Fernando Eco-Innovation Award 2016 Waste Concept Sector Winner. Plass Game Box. H. Mahendra Prasad Peiris - Merrill J. Fernando Eco-Innovation Award 2016 Blue Economy Concept Sector Winner Strip-Spreading Tea Bushes. K.K.L. Madusanka - Merrill J. Fernando Eco-Innovation Award 2016 Biodiversity Concept Sector Winner. In addition to the following prizes, each winner received an engraved trophy and a certificate. All shortlisted applicants will receive a Certificate of Achievement. Overall Winner (Prototype): Rs. 1,000,000. This winner will be granted Rs. 500,000, a further Rs. 500,000 will be awarded as collateral for a bank facility to commence commercial production. This additional sum of Rs. 500,000 will only be awarded if the winner elects to commercialise the prototype for wider benefit of the society. A bank loan from a reputed bank could also be facilitated. Overall Winner (Concept): Rs. 500,000 Sector Winners: Rs. 250,000 each. The panel of judges were Blue Economy - Panel Facilitator: Professor Ajith de Alwis, Professor at Department of Chemical and Process Engineering, University of Moratuwa and Project Director, Coordinating Secretariat for Science and Technology and Innovation (COSTI). Prof. De Alwis was joined by Dr. Nilwala Kottegoda and Mrs. Shiranee Yasaratne in evaluating submissions made under the Blue Economy Sector. Waste - Panel Facilitator: Dr. Sumith Pilapitiya, Lead Environmental Specialist at the World Bank. Dr. Pilapitiya was joined by Pradeep Pethiyagoda and Nadeera Rajapakse in evaluating the submissions made under the Waste sector. Energy - Panel Facilitator: Shiranee Yasaratne, Advisor, Biodiversity Sri Lanka. Yasaratne was joined by Dr. Nilwala Kottegoda and Prof. Ajith De Alwis in evaluating submissions made under the Energy sector. Biodiversity - Panel Facilitator: Professor Sarath W. Kotagama, Professor of Environmental Science, University of Colombo. Water - Panel Facilitator: Professor Sarath W. Kotagama, Professor of Environmental Science, University of Colombo. Overall Winners Panel: Merrill J. Fernando, Founder of Dilmah Tea, selected the overall winners from the nominated sector winners based on the replicability, sustainability and commercial viability of the innovation. “Innovators thrive when the system to which they belong supports inventiveness and creativity. Dilmah Conservation thus plans to provide the environmental ideators and innovators of Sri Lanka the support they require to foster their ingenuity and in doing so encourage and strengthen eco-innovative solutions in Sri Lanka,” a spokesman for the company said.